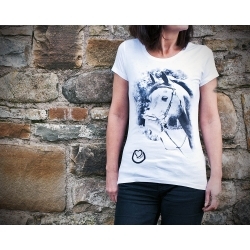 Ladies Designer T-Shirt - Chalice by Urban Horse in White. 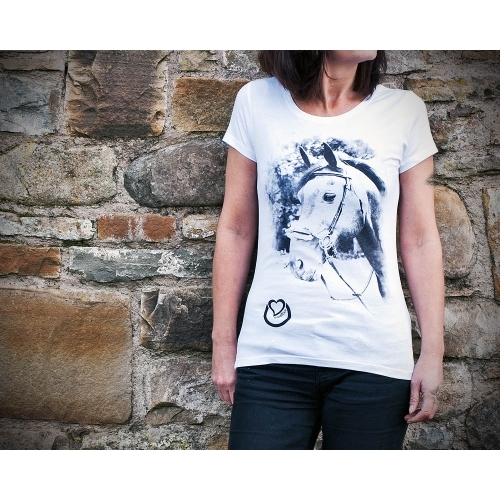 Look and feel great in this Urban Horse 'Chalice' ladies designer Tee. A unique contemporary design, round neck t-shirt made especially for you by Urban Horse. You will look fabulous, on or off your horse, in this super soft single jersey 100% organic ring spun combed cotton Tee. It has a fitted design and longer length for added style and comfort too! Ideal as gift for you or your style conscious family and friends - And why not complete your wardrobe with all 5 original Urban Horse designs!